The Forum @ St. Ann’s is presenting “Landscape of Paradise: Golden Floating Path” by artist Scherezade Garcia, featuring a dramatic installation exploring the theme of migration, and invoking the suffering of migration journeys made under duress. The exhibition may be viewed Tuesday-Thursday, 12:00-3:00 pm, Sunday 9:00 am-1:00 pm, and by appointment at office@stannholytrinity.org through December 1. The public also invited to an Artist’s Reception with Scherezade Garcia which took place on Sunday, November 12, at 3:30 pm with opportunity to view the exhibition and join a discussion with Garcia. Scherezade Garcia is an interdisciplinary visual artist born in Santo Domingo, Dominican Republic, and based in New York. In her work she addresses contemporary allegories of history and processes of colonization and politics, which frequently evoke memories of faraway home and the hopes and dreams that accompany planting roots in a new land. Her works appropriate and transform objects and symbols, including life preservers, inner tubes, suitcases, mattresses, tents, umbrellas, religious iconography and newspapers. 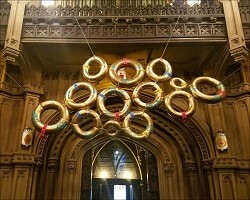 For “Landscape of Paradise,” Garcia has configured inner tubes of various sizes “dipped” in gold and attached with electrical ties to allude to the pain and suffering endured by refugees and migrants. The assemblage suggests an archipelago, alluding to the many “islands” in New York and elsewhere in the world where communities of once wandering and lost individuals hope to discover a paradise that so often eludes them. Garcia holds an AAS from Altos de Chavón School of Design, a BFA from Parsons-The New School and an MFA from the City College of New York. She has exhibited extensively here and abroad and her work is in the permanent collections of the Smithsonian American Art Museum, El Museo del Barrio, The Housatonic Museum, Museo de Arte Moderno de Santo Domingo and private collections. Her personal papers are in the collection of the Archives of American Art at the Smithsonian Institution. Garcia is a faculty member of the Parsons School of Design in New York. Photos of “Landscape of Paradise: Golden Floating Path” and the Artist’s Reception may be viewed here.